This time I used 12X12 canvas with deep edge. We gathered few girls for a creative mixed media evening, and creative it was! We shared ideas and techniques, helping each of us making something different then we use to. For me, it was the first time I used a woman's figure on a canvas and I love the result very much! The background of this canvas I created about 2 weeks ago, but I haven't decided yet what to add it, so he stays like that until few days ago. This time I used pattered paper for the background, I put some paint on them, glimmer mist on a stencil, some stamps and finally I put pink past with stencil. When I started with the paints on the project I noticed that I always use the same colors and the background come out very similar each time, so now I decided to add some new colors and this is how the red was born. When I saw that it was very good, I continued and add the pink for the past so it will be a contrast for all the colors on the project. On one of my latest LO I used a kite sticker, and from there I got the idea to add a kite on this project too. Today we are celebrating Passover, in this holiday we celebrate freedom, miracles and faith and also spring and the awakening of nature. Every year few weeks before the holiday we start thinking about gifts for my parents for the holiday. My mom is well known with her habit not to use all the beautiful kitchenware we buy her because they are too pretty.... so we stopped buying her those dishes long ago. Instead, every year I create something for them: printed canvas with photo from their wedding, designed frame, last year I created the hand made Hagada for Passover and this year I decided to make them mixed media canvas, my new love. I created a colorful and festive canvas that goes great with the holiday spirit, full of flowers like the spring that just arrived. I just hope you can see the layers of colors and texture that make this canvas so great. I've been interesting in mixed media for few month now but didn't have the try it yet. All this time I've been following blogs of great mixed media artist and learned a lot. Last Saturday I had a relaxing and quite day so I pull out a canvas, paints, mediums and every thing else and started to work on a canvas. I worked without planing and decide to go where the road (or the paints in this case) lead me. So, I cut papers and glue them, added printed tissue paper, on top I spread paint, more paint and more paint with few techniques, stamped a little, and few more stamps, then rubons and more paint until this canvas was born. Time is the most precious thing there is and it is the only thing that when it gone by you can never return or start over. We tend to forget it sometimes when we are busy with our daily life and we forget to appreciate the little moments that gives meaning to our life and to our existence. Each on of us has his own family, that doesn't has to be blood relates of course, and for most of us it is the most important and significant thing there is, because with our family we share the most special and magical moments we have in our life. Last Thursday we celebrated Family day and for that occasion I created a clock canvas with a photo of my father and my son, in a special playing moment. These days we are celebrating Hannukah. Hanukkah is an eight-day Jewish holiday, this is a holiday of miracles, light and victory. This holiday is here to remind us that miracles do happens (if we only believe) and darkness need to be expel and instead of it we need to fill our life, and the whole world, with light. This printer tray I made for Hannukah project. Lately I am in a mood of pregnancy LO and one of Hannukah's symbols is miracles so when I thought about a theme for the project I knew that I will make something related to pregnancy since birth is the greatest miracle of all. The symbol of light also connected to the motif that is going through all my pregnancy album: dark background papers and colorful embellishments that banish the darkness and bring the light to the album. 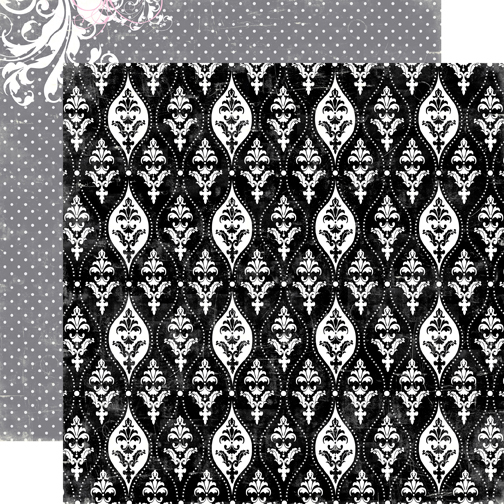 I continu this motif in this project too. Only this time I wanted to make something special for the holiday so I design this printer tray and called it: "miracle of life". This is "metal treasure Illume" from Prima and I added red and orange stickles on top like the flames of the Menora of Hannukah. The dreidel is one of Hannukah's symbols and the children play a lot with it. I couldn't find one in the size I wanted so I made one from cardstock and the size of the square part is 1 cm. Slowly, step by step, I am making my second pregnancy album. A quiet day get me the chance to make few more LO. My concept for this album is using dark cardstock as a background and the colors for the LO will be from the embellishments I will add. This time I used dotted black cardstock from For the Record collection by Echo Park. All the stickers are from Victoria Garden collection and the tag is from For the Record collection, both by Echo Park Paper. This is a mini book I made that comes as a box and when you take the cover off, it's becoming a 2 layers mini book. I used MME papers because they are heavyweight so the structure will be strong enough and not fall down. It's been long time since I last wort here, I've been very busy (not an excuse, I know...) but I am promising that it will not happen again! Last week we celebrated Passover, and on that holiday the tradition is to read the Haggadah. The Haggadah is like an "instruction manual" that tells us how to perform properly the Seder, that is the meal and highlight of Passover. The meaning of Haggadah in Hebrew is “telling", and the intention of it is to tell and narrate the story of the Hebrew's Exodus from Egypt. This year the hot thing was to make a digital Haggadah as a present for the family. 3 weeks before the holiday my sister and I talked about what present to give to my parents this year and she suggested the digital Haggada with photos of all of us. Since I am a scraper I thought to myself: why digital and not handmade? Apparently I was thinking out loud, so I couldn't get a way from creating one. I decided to create a special Haggada, that is hand made and to create everything from scratch, including the covers. My intentions with creating this Haggadah is not to make something that will be for reading, but to do something special for the next generations, something that I will leave behind me. So, 2 weeks only before the holiday the decision was made. The truth is that I didn't know how much work it will be and that 2 weeks is very little time, but I started so I had to finish it. I used about 50 pages from Prima, Fancy Pants, DCWV, Bo Bunny, Melissa Frances and Pink Paislee, and as you can see, I didn't use a lot of embellishments, after all it suppose to be an Haggadah and not photo album. I used a lot of interactive techniques so It will be more interesting and I could add more photos. So here it is: the first handmade Haggadah in the world. The firs page of the Haggadah is our family picture, and it says: Haggada to the Darry Family. One part of the Haggadah speaks about the four children: one wise, one wicked, one naive and one who does not know how to ask. These four children represent different types of people who needs different explanations to be convinced to leave Egypt. In the photos are me and my 3 siblings. This is were the first part of the Haggadah ends, with the big happy meal. I have 13 more pages to show you, and this will be in the next post.